My grandmother was diagnosed with the early stages of Alzheimer’s disease when I was in fifth grade. At that point in my life, I was a kid. I was selfish as all kids are, so I didn’t think twice about it. I had no idea how it would eventually affect my life, as well as my family, in such a large way. I have a very tight-knit family, and my grammy is the glue that holds us together. I remember going to my grandparents’ farmhouse every moment I could when I was a kid. My grammy would always make me chocolate milk and a peanut butter and Fluff sandwich. We would watch Winnie the Pooh movies and color—my grammy and I both love the smell of a new box of crayons. Sometimes, if I were lucky, she would take me to the barn to feed the calves or to see the new kittens. Little did I know, these would be the memories of my childhood that I would miss the most. As I grew up, I noticed my grammy changing. At first, it was just little things. She would forget where she set her book, or she couldn’t find her purse. Once again, I didn’t think it was serious. I could never have guessed how it would progress, transforming my grammy into someone I could hardly recognize. About three years ago, a tornado went through our town. Although it was heading straight for my grandparents’ farmhouse, it died down before destroying my childhood sanctuary. My father and I went to visit my grandparents the day after the storm, just to make sure they were okay. I went inside to find Grammy. I gave her a hug and took my regular seat on the couch across from her. We passed the time by talking for hours on end, about anything and everything that was on our minds. The power was out, and it got dark in what seemed like a matter of minutes. Then, Grammy turned to me, and with empty eyes that stared right past me, asked, “Now you’re graduating this year, aren’t you?” I was a freshman, so I was confused why she was asking me about graduation. Grammy was the type of person who could tell you the exact date and time when every one of her grandchildren came into this world. Her innocent question caught me off guard. I assured her that no, I was not yet a senior; I still had a few years until graduation, and casually moved the conversation along. It took him a long time to come up with a response, and when he finally did, I heard the sadness in his voice. “Yes. She may not know where she is, but she will be there, no matter what.” I looked at my father, and I saw a tear running down his cheek. I had never seen him cry. The rest of the car ride home was silent. When we finally arrived home, I went straight to my room. I locked my door and I cried for hours. That night made me realize that things were going to start changing fast. Ever since that talk with my grammy, I have matured and stepped up. Her Alzheimer’s has progressed to about stage 3 now. She is at the point that she can’t see what is directly in front of her. When I see her get that look that says, “I don’t know where I am or what I am doing,” it’s my automatic response to help her by getting her a plate of food or easing her into a chair. At first, I didn’t notice the strange looks I got from the other members of my family. Then, last summer, when I was cutting Grammy’s food at a family picnic, I looked up and saw all my aunts, uncles and cousins looking at me. I just ignored them for the moment and went back to helping Grammy. Later on, I asked my mother why they looked at me like that. She explained that they still picture my grandmother as the one who takes care of everyone else. They had not yet realized that the roles had switched; after years of being the sole caregiver of the family, she was the one who needed their help. Chicken Soup for the Soul: Living with Alzheimer’s & Other Dementias is now available for purchase, with all royalties going to the Alzheimer’s Association. Read all the inspiring stories. At my graduation, when I am sitting on the stage waiting to receive my diploma, I will look out over the crowded gym and see Grammy there, sitting with the rest of my family. She may not understand what is going on, but she will be there. After the ceremony, I will find Grammy in the huge swarm of people, and I will hug her. I know she will forget me someday, but I am not dwelling on that fact. For now, I try to cherish the good days and to get through the bad days as best I can. She will always be my grammy and I will always be her granddaughter. Author’s note: Since the original version of this story was written in 2011, I graduated from high school. I am happy to report that I was able to give my grammy a hug as I walked out of the gym. As my father promised, she made it to my graduation. From the book Chicken Soup for the Soul: Living With Alzheimer’s & Other Dementias by Amy Newmark and Angela Timashenka Geiger. Copyright 2014 by Chicken Soup for the Soul Publishing, LLC. Published by Chicken Soup for the Soul Publishing, LLC. Chicken Soup for the Soul is a registered trademark of Chicken Soup for the Soul Publishing, LLC. Reprinted by permission. All rights reserved. Next month, Mary Margaret and I will have been together 50 years. She is a very positive gal, extremely caring and inclusive with her friends. I am not always a social animal. Mary, however, is very outgoing and makes new friends easily. These days, we are attached at the hip… but it wasn’t always this way. In 2009, I was diagnosed with Alzheimer’s. After I received the diagnosis our lives changed. At the time, Mary Margaret and I were living in California, but this news caused a great sense of stress, so we relocated to Minnesota to be closer to family. Moving wasn’t difficult – it actually took a weight off our shoulders. Then one of my wife’s friends said “Why don’t you call the Alzheimer’s Association’s 24-hour helpline?” That really changed our lives. Not only have I become very involved in the Association, but so has Mary. During our career years, we really did very little together – now we do everything together. Our connection to the Alzheimer’s Association and shared commitment to raising awareness of the disease has brought us closer together as a couple. Before I received the diagnosis, Mary and I were absorbed in our separate professional lives: She had her activities, and I had mine. If we got together on a Sunday, it was a big deal. It’s almost like we are dating all over again. She has turned me on to subjects I wouldn’t normally be interested in, and we have immersed ourselves in an eclectic series of programs. She is an avid reader and I’m not; however, through themed book presentations I have been able to learn something new with Mary, and that was a different experience for me. In turn, I have turned Mary on to the arts and now we are both passionate about visiting museums. There isn’t a local museum we haven’t been to! We support each other. The experience for caregivers and care partners is unique to the relationship. Mary and I support each other on a daily basis; we have to. She is the social contact, the “hostess with the mostess”, and I am her assistant, you might say, helping in the ways I can. I’m not a terribly patient person, so I am trying to be more patient, which is the least I can do. The biggest thing that I notice is her relationship with other caregivers. I have a deep respect for the sacrifices that caregivers make every day to support individuals like me who are living with the disease. Today, there are more than 15 million unpaid caregivers of people with Alzheimer’s and other dementias in the United States. The role is demanding; they are our lifeblood. Mary Margaret’s compassion extends beyond our relationship. She spends much of her free time talking with other caregivers; learning from others and offering support. She has hundreds of followers from all over the U.S. on Twitter, and she will refer articles to them to get feedback and exchange ideas. Compassion is in her genes! During National Caregiver Month, I want Mary Margaret and other caregivers to know that I am grateful. THANK YOU! What makes a caregiver in your life special? 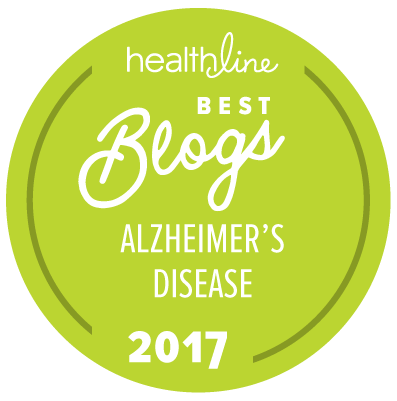 Leave a comment here on the blog, or leave a tribute for a caregiver or care partner at the Caregiver Center.